The end of the semester has crept up on us and it’s already time for SBAI to take a short break over the holiday – but don’t worry, we’ll be back after the New Year! A break from school or work over the holidays can leave some with a lot of free time (if you’re not traveling too much! ), and it can be the perfect time to get more involved in supporting our communities. You can have fun while doing so by shopping for your friends and loved ones at one of Rochester’s many unique small businesses or sharing a holiday treat at a local eatery. You don’t have to travel far to make an impact, either – use your holiday meal times as opportunities to speak up! For students, If you’re traveling home over the holidays, invite a student who isn’t able to make it home this year to join you. Generosity like this is so incredibly appreciated, and so seldom experienced. And if you want to dedicate a little bit more time, Family Service Rochester, Sojourner House, and Foodlink are a few of many local organizations that would love extra help during this time of year. The need for advocates and activists in our communities is unending, and because of this it can be hard to remember to take time to listen to your own voice. You’ve all heard people tell you that to love others you must first love yourself – the same goes for helping others – you must also care for yourself. Taking action to take care of yourself may not be considered a direct step toward social justice, but it is extremely important in sustaining your activism steam! Many activists work in close proximity with very difficult situations. These situations can wear on a person even if that person has spent time preparing for and decompressing after these experiences. When you’re worn out, trying to do work that you know you love can become a strangely negative experience. Exhaustion can manifest itself physically, mentally, behaviorally, and spiritually. 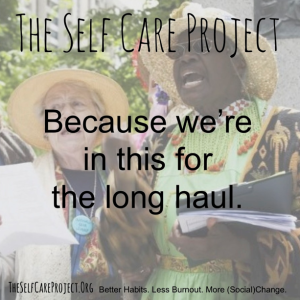 If you’ve been burning the candle at both ends for too long, you might find some parts of the “Sustainable Activism & Avoiding Burnout” guide to be very familiar. If you feel like your fuel is running low, take time to identify what your needs are and ways you can try and meet them. For some suggestions on good ways to decompress and re-up, visit this post at Spectra Speaks, a blog by Queer Nigerian Afrofeminist Writer and Media Activist, Spectra, where she outlines steps you can take to scheduling self-care time into your busy activist schedule – a MUST for those of us who are married to their calendars. Happy Holidays! Rest up, schedule some regular time just for yourself, and continue to change the world!